Add all the ingredients in a cocktail shaker, except for the slice of ginger, mint sprig and (of course) the short straw. Shake vigorously with cubed ice and strain into a mug or rocks glass, filled with cubed ice. 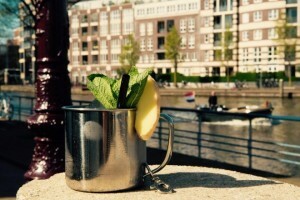 Garnish the Minty Mule with the ginger, mint and straw. Enjoy!